Xenon is a hybrid Resistance class that uses both strength, dexterity and luck. 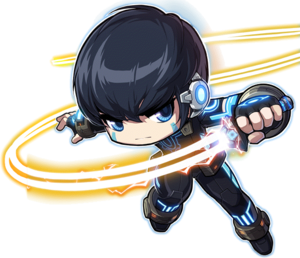 He uses an Energy Sword as his primary weapon and a Controller as his secondary weapon, he has an extra slot for Android Hearts as well. Although the story represents him as a male, he can be created as both a male or a female inside the game. Surplus Supply can be charged which can and will be consumed by some of his skills. Skills that consume his Surplus will have a blue flag icon indicating it uses Surplus. At a total of 20 Surplus Supply slots, each Job Advancement will supply you with 5 more Surplus Supply slots. Starting from the second job, some skills have different modes with a different effect. To change the mode of a skill, simply press and hold on the skill key and you will have options on your character to select the mode. Gelimer kidnaps Xenon for many many years until the recently betrayed Orca gave word that Xenon is being tested. Once the Resistance instructors break into Gelimer's lab, Xenon's test has finally been completed. Xenon is sent by Gelimer to stop then but after seeing Claudine; he realizes that his memory has been taken away. He runs away with the Resistance in an attempt to regain his memories back. Once you complete the tutorial, you will automatically be first job. Once you hit level 30, you will receive a quest from yourself. Tonero from Heliseum will hand you a letter from Claudine, and you will be warped to Veritas. Talk to Professor Dreamboat, and you will advance to second job. Once you hit level 60, you will receive another quest from yourself. Promathus from Veritas will talk to you, and tell you to buy a Black Wings Hat from Stephan at Dry Road : Road to the Mine 1 in Edelstein. Once you purchase it for 100,000 mesos, Stephan high-tails it while one of the Black Wings Henchmen arrives and question you. When he mentions taking you back to Gelimer, you must defeat him (don't worry, it's very simple). Afterwards, accept the quest from yourself, and head back to Veritas to talk to Promathus to advance to third job. Once you hit level 100, you will receive yet another quest from yourself. After accepting, talk to Roo-D via lightbulb on the side of your screen, and you will advance to fourth job. This page was last edited on 27 March 2014, at 16:16. This page has been accessed 75,393 times.